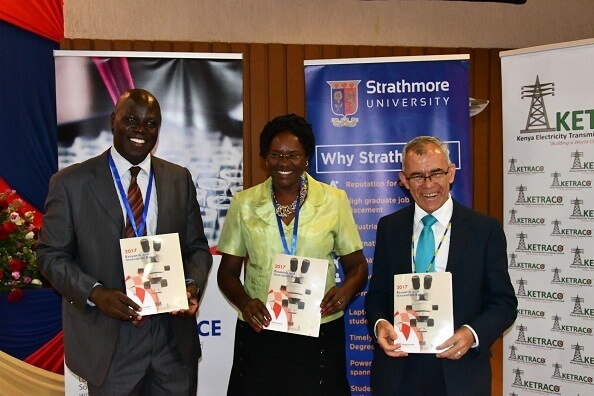 Prof. Ismail Ateya, Dean, Research and Innovation; Dr. Susan Kibue, Chair, Oversight Committee of the University Council; and Prof. Izael Da Silva, DVC Research and Innovation displaying the 2017 Research and Innovation Report launched during the conference. More than 150 papers from the university’s staff members, key industry players, and research partners were presented at the 2018 Research and Innovation Conference. The conference, whose theme was ‘Looking into the Future: Solving Tomorrow’s Problems with Today’s Research’, took place from 29th October – 2nd November at Strathmore University. Undergraduate students were not left behind; they had 46 presentations, with the first two days of the conference dedicated to them. The Tourism and Hospitality track hosted the 3rd African Conference on Sustainable Tourism. This conference focused on engaging advanced level students, lead researchers, industry players, and government officials in areas such as community and conservation and tourism and rural development. Also taking place within the week was the inaugural Food, Energy, and Water (FEW) Nexus Forum organized by Penn State University. The aim of the nexus was to address challenges in food, energy and water systems. Some of the FEW Nexus discussions concentrated on fostering strategic partnerships to create an enabling environment for food security and agro-pastoral development within the country, drought management and rainwater harvesting and management for agriculture and domestic use. On the fourth day of the conference, in a roundtable discussion focusing on the theme of the conference, panelists highlighted the need for research to influence policy and why academic and research institutes should be linked to industrial needs. This event was intended to provide a platform for celebrating the research activities of the staff and students of the university and to deepen the university’s research partnerships.